OK, a couple of days ago, I promised to tell a story about this photo. On the surface, it looks pretty typical. Here's a bunch of Bubba Boyz. They are National Park Service Wildland Firefighters on the Engine #51 crew based in Kings Canyon-Sequoia Nat'l Park's Grant Grove. 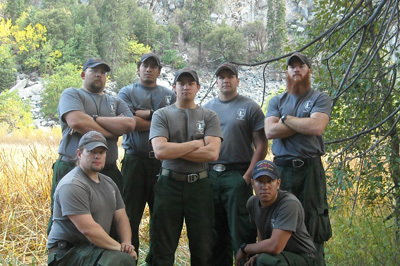 They look pretty much like any other Engine crew in the NPS, Forest Service, BLM or whatever. What makes them so special as to wind up on this blog? The National Park Service is embracing social media with such enthusiasm it's almost scary. The highest level of the National Park Service--the very tippy, top highest level of this age-old bureaucracy has decided social media is totally cool. And to prove their commitment, the Big Wigs of the NPS have a Twitter feed where they place the most unlikely of material. Obviously, that's how I found this bunch o' Bubba Boyz. Now in The Old Days, you would have expected the NPS to use their Twitter feed to brag about rarified bureaucrats and how the Director did this or that and how the so and so's at the highest level were God's Gift to Mankind. Well, it ain't that way no mo. Nope, the highest level NPS Twitter feed is using its power to showcase unusual stories of unusual rank-and-file people who toil out in the field. We're talking a Twitter feed that COULD be talking about people in the GS-20+ pay grade instead showcasing people in the GS-5 pay grade. This amazes me. That's why I wanted to talk about it here. This newfound reality is a Game Changer because it's completely restructuring how people view the NPS--both people INSIDE the system and people OUTSIDE the system. Frankly, prior to this amazing development, I had a low opinion of the NPS that had been formed with many years of a negative feedback loop. My experience with the NPS started in 1980 with the Grand Canyon. Oh, the stories I could tell. Then we became neighbors of Montezuma Well Nat'l Monument in 1984 and had nothing but angst for 18 years before a new Supt. came onboard. Earlier this week, I was chatting with Rex V. , the local NPS Ranger here, and I shared with him how much the NPS social media strategy is working and how it has given birth in me to a whole new level of respect and admiration for the NPS. I told him my enthusiasm for the NPS is at an all time lifetime high. I am excited again about the NPS. I don't see them as a bunch of bumbling, inefficient bureaucrats in self-imposed strait-jackets any more. It's an entire life sea change for me and I am loving every minute and every Tweet of it. Sometimes when I see the great stuff that the Top Level NPS Tweets or some of the individual units Tweet, I want to jump out of my chair and CHEER. Gosh, I know that sounds pollyanna-ish but it's true. I'm "all in" now as a reborn NPS Fan--Big Time! Not long ago, the NPS Twitter feed featured the awesome blog of some obscure people up in Denali, Alaska, who run the NPS sled dog program up there. The blog is so danged good, I get goosebumps reading it. We're talking about real people here--not hoity-toity big wigs. Nope, these people are down in the trenches doing stuff that normally no one on earth would know or care about. But that's not the case now. I am such a big fan I can hardly wait to read their next installment of a life that is basically beyond my comprehension here in relatively sunny Arizona. Click here for the main blog address. However, if you want to read about a typical work day in -30 to -40 F degree conditions, click here. (Note: If that last link doesn't work, go to the main blog and find the December 18th post called "Days On The Trail." Other unexpected Tweets you will find on the NPS Twitter feed are all about making a New Orleans jazz gumbo or how an 1860 map depicted slavery with graphics much like a Google or GIS map could do today. This is really rich and exciting stuff to a geek like me but somehow I feel it is only the tip of an emerging iceberg. I feel now that we are on the cusp or many great and amazing things yet to come from the NPS and it's brethren. I mean, gee, look at the staid ol' Forest Service posting up YouTube videos! All these new and surprising developments remind me of that classic line of code sent by Samuel F.B. Morse on May 24, 1844, to open the first telegraph line between Baltimore and Washington, DC--"What hath God wrought?"